Hope you are doing well. 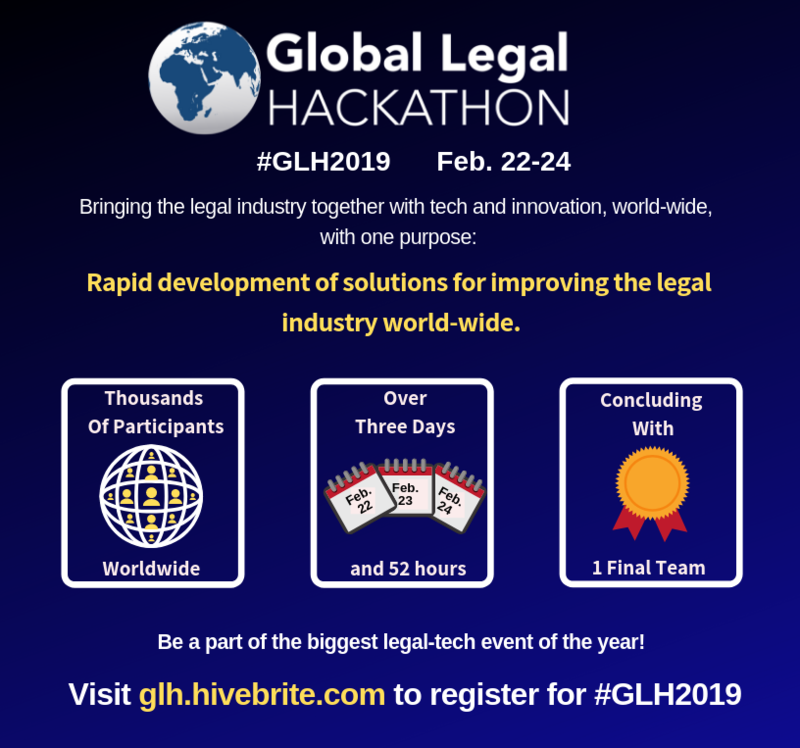 I wanted to personally invite you to join us for the Global Legal Hackathon 2019 on February 22-24. The Global Legal Hackathon is the largest legal technology innovation event in the world. Last year, over 40 cities and 22 countries participated, and this year it is likely to be even bigger. As the host for the event, we would like to invite you to join us as we represent [Insert City] at #GLH2019! For those of you who have not been to a hackathon, it is likely to be the most interesting 52 hours you’ve experienced. The hackathon runs from Friday evening to Sunday evening. During the three days, teams are formed around individual pitches, who then work together to develop a Minimum Viable Product. On Sunday at the end of the day, teams will present to a panel of judges, who will select one winner at each location. The winning team goes into a virtual semi-final and then the finals take place in New York in May. During the two days, the teams will be mentored by industry experts. This year, we are introducing a global panel of senior women from the legal industry to support women-led teams, as part of the Global Rise Of Women in LegalTech “GROWL” initiative. So, if you are a legal professional, tech or UI / UX expert, a law student, have marketing experience or are just interested in innovating, the hackathon provides you with that unique opportunity. You will be surrounded by other like-minded individuals who will challenge your thinking and take it to a higher level. The event is less than a month away, so register ASAP. See you at the hackathon. Thank!